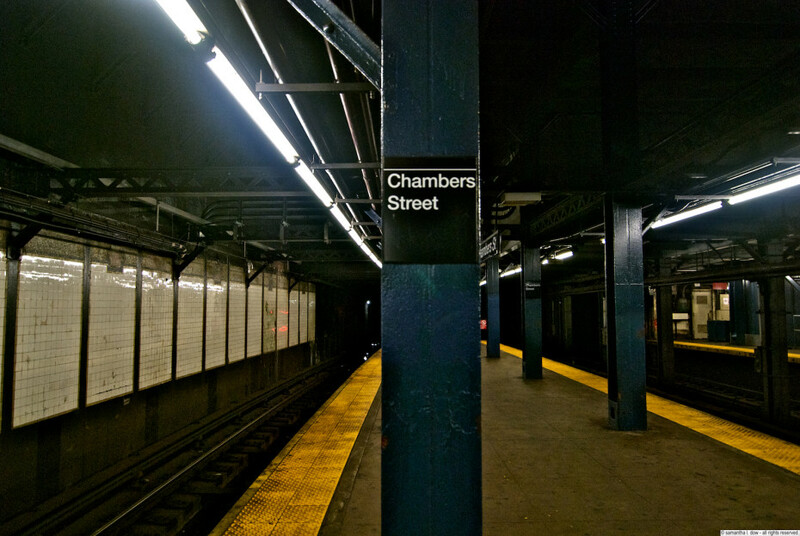 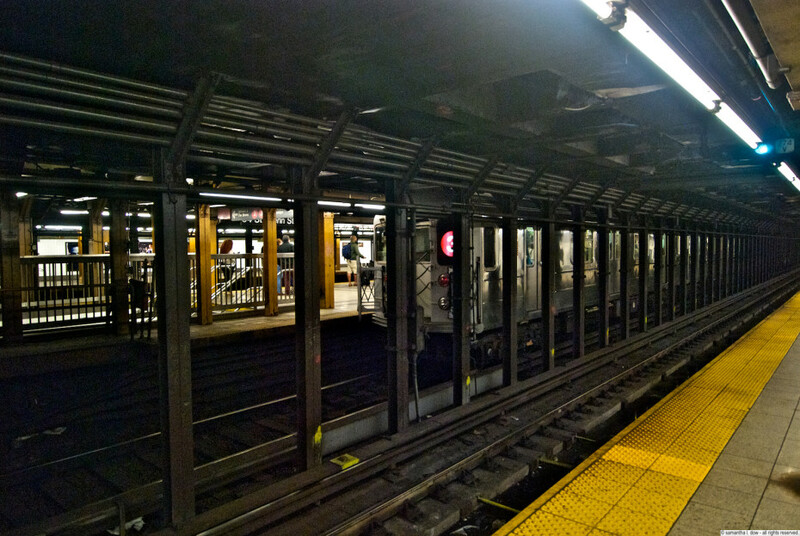 This platform/station is a combined transfer station with the Chambers Street A/C/E (IND) and forms a fairly large complex, but those platforms will be addressed separately. 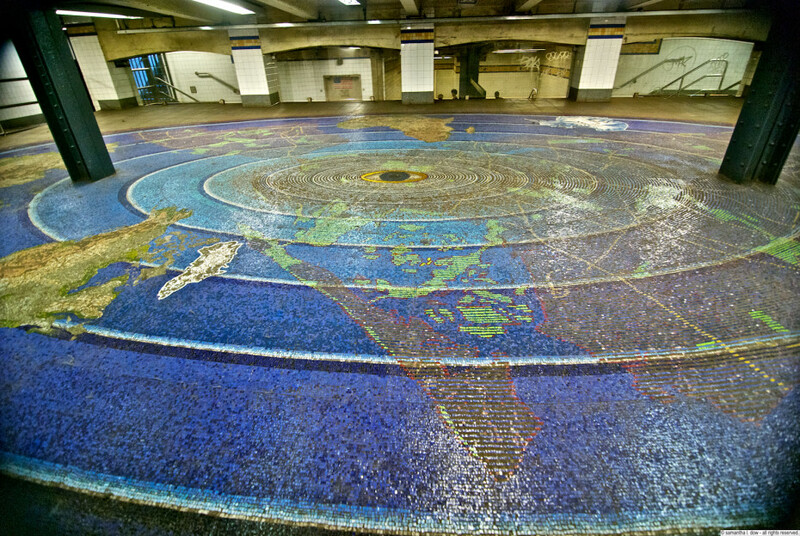 Directly upstairs from the 2/3 train platform itself is the first part of the “Oculus” mosaic, consisting of a giant tiled map of the world radiating out from an eye. 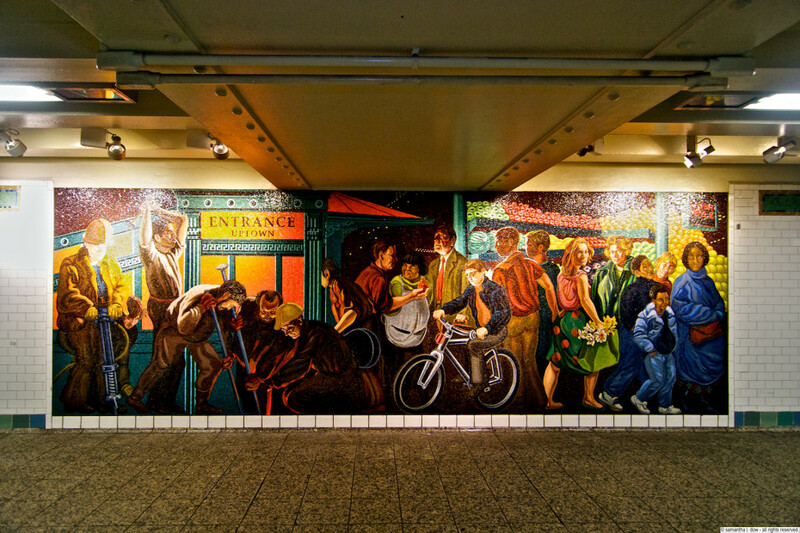 The remainder of this installation will be addressed in the entry for the Chambers Street station. 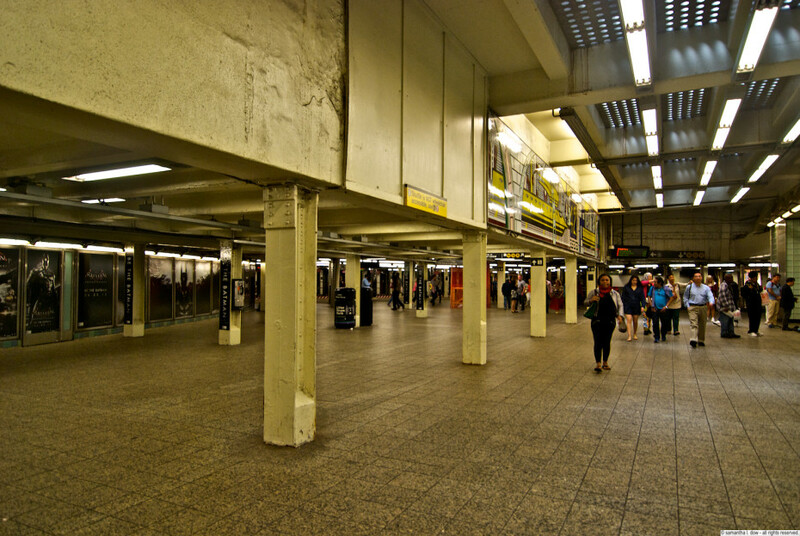 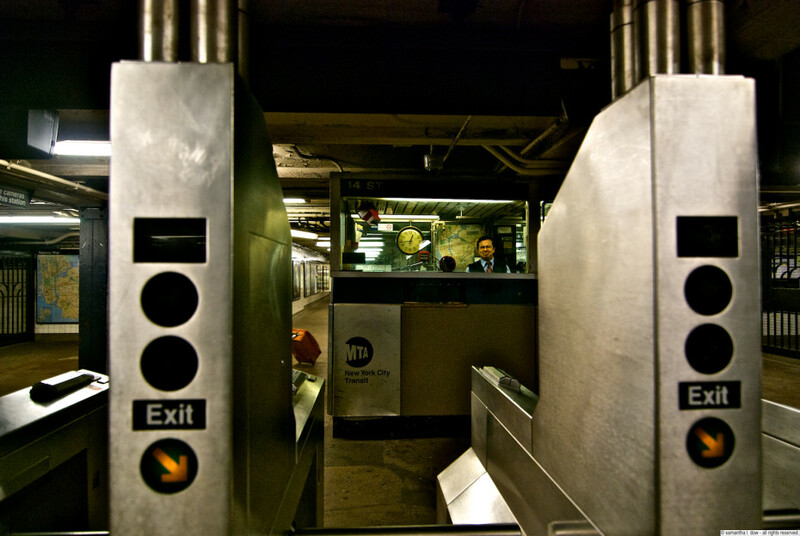 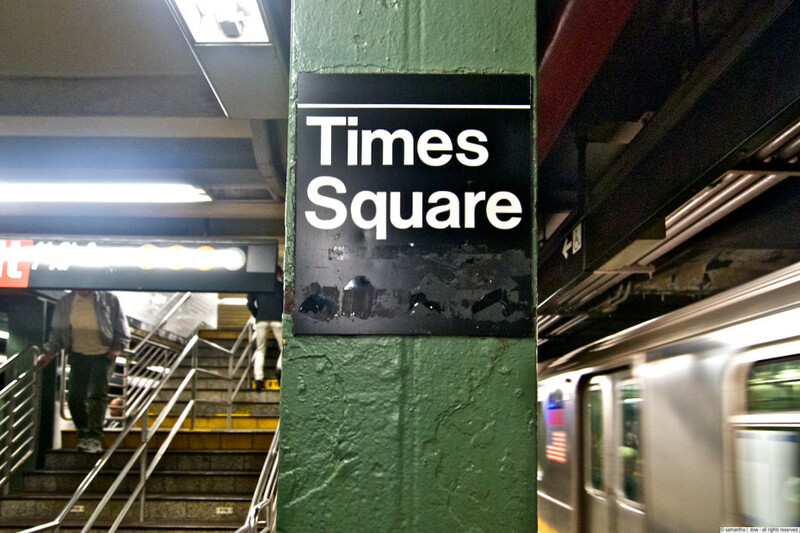 The entire mezzanine runs approximately 7 blocks, and used to also contain a station specifically for the World Trade Center. 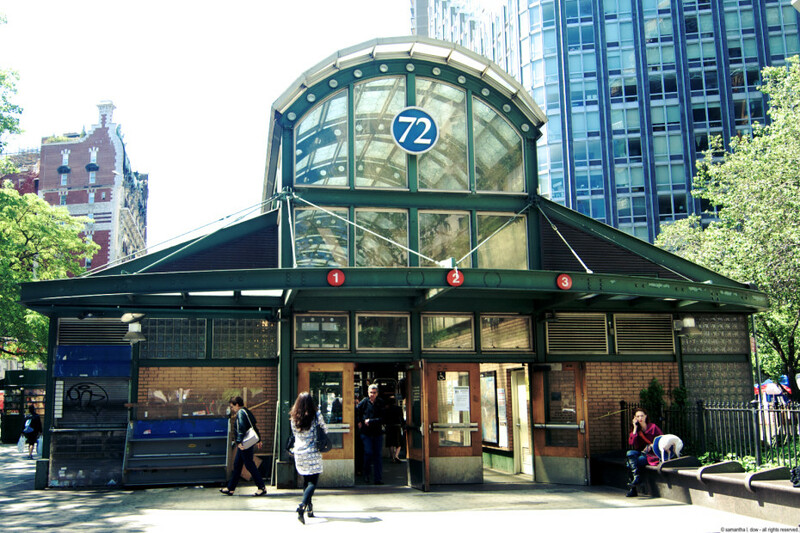 The station, including the mezzanine with Oculus and the platforms, were damaged and flooded on 9/11. 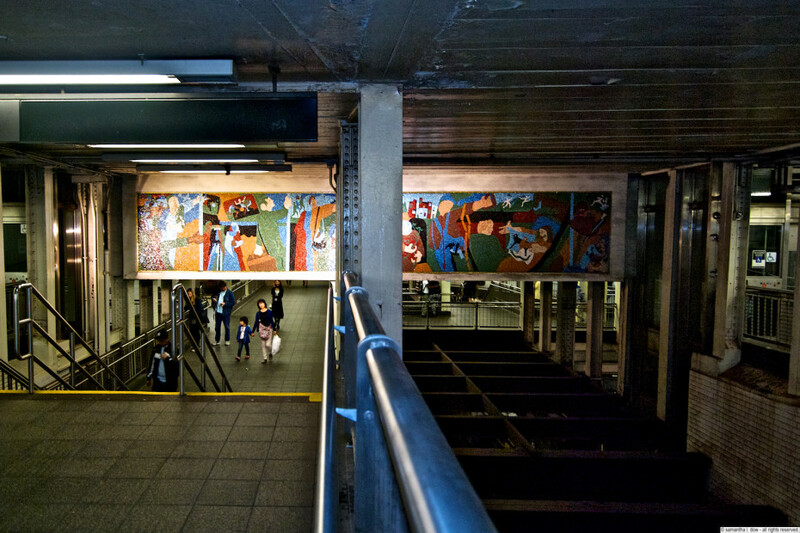 The artwork remained mostly intact and the station reopened 8 months after the attacks. 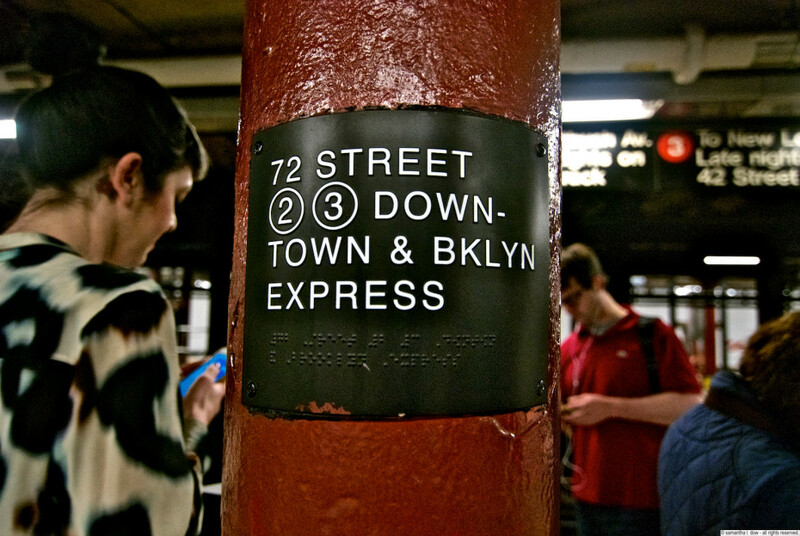 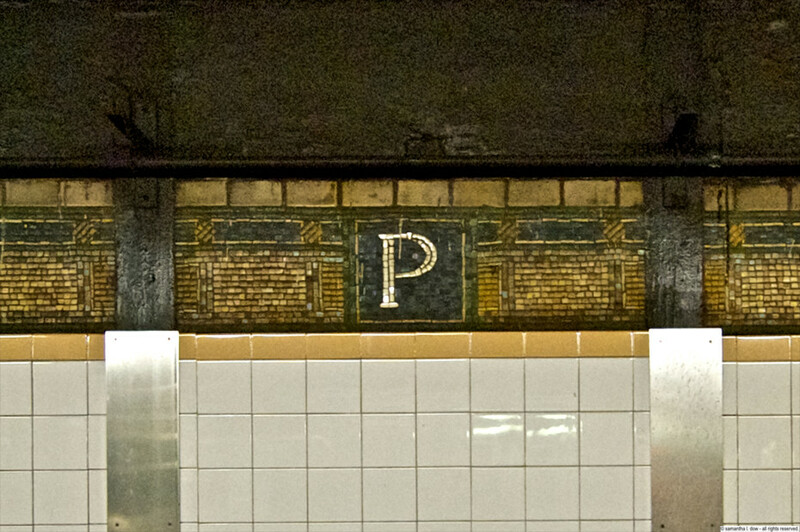 The Park Place platform itself only contains the standard IRT wall ribbon with the identifying single letter indicating the station. 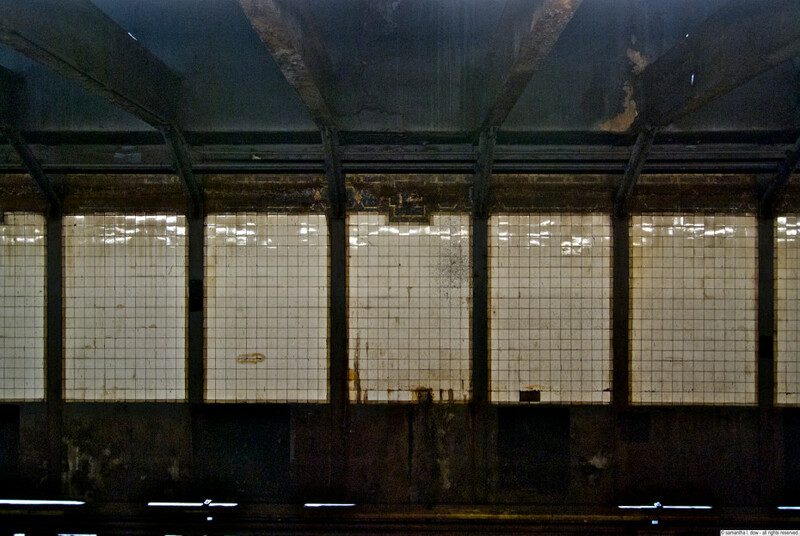 There is some obvious and extensive water damage going on at this platform, but it’s hard to say whether this is remnants of the flooding that occurred or just normal wear-and-tear of the last 14 years. 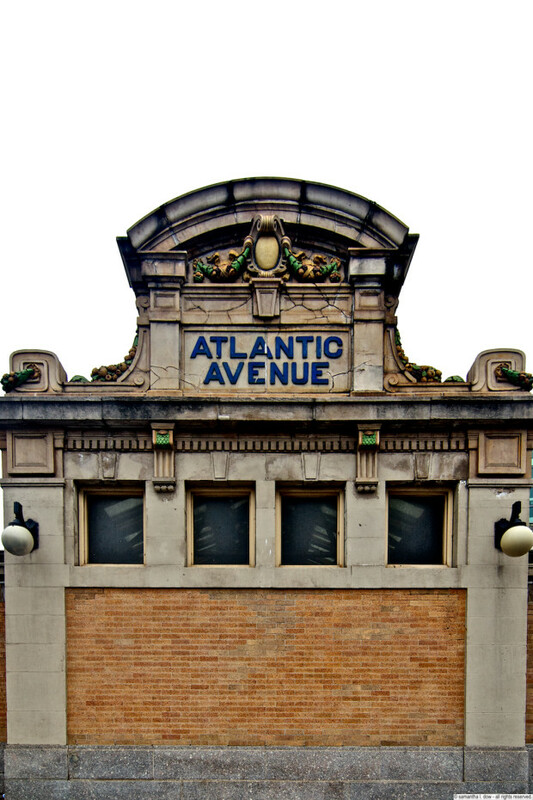 The Atlantic Avenue station is a monster transfer station in Brooklyn, that has been completely renovated in conjunction with the development of the Barclays Center. 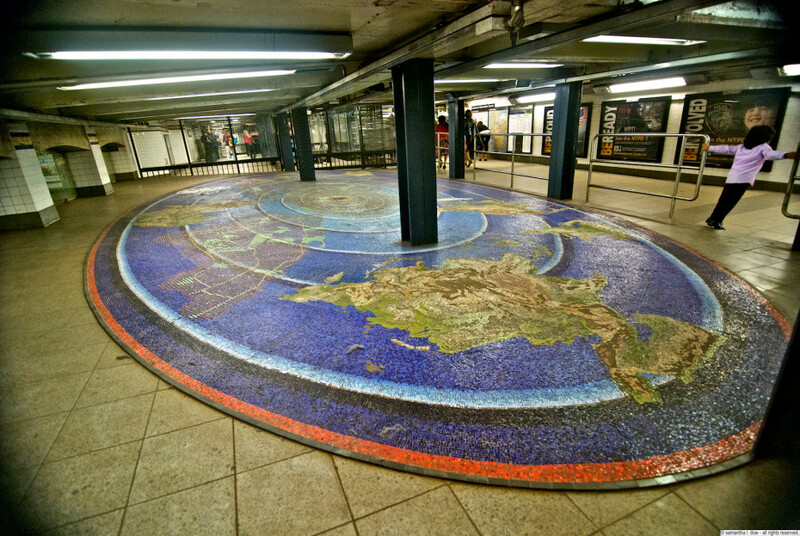 It actually connects 9 different subway lines, but through a series of connections and different platforms. 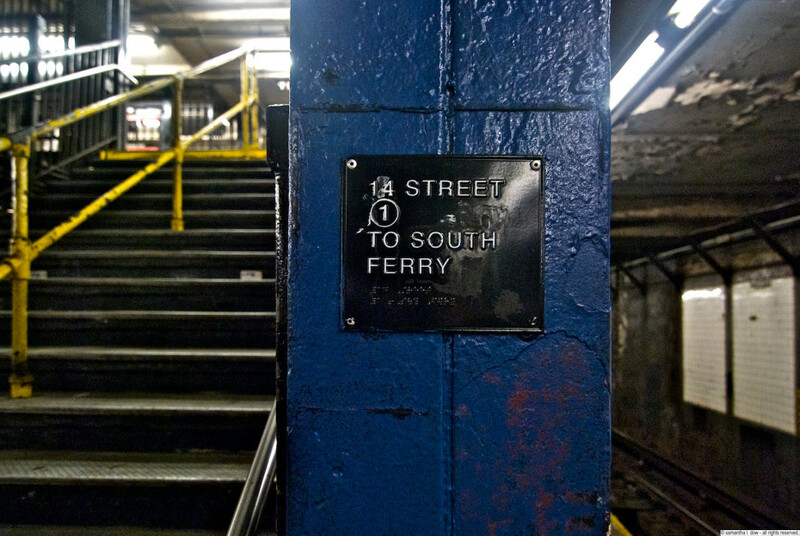 I only ended up here because I was attempting to ride the D train along the route to Coney Island, forgetting that it was the day of the Mermaid Parade, making the trains an overcrowded mess, so once I hit Pacific Street, I turned around and came home. 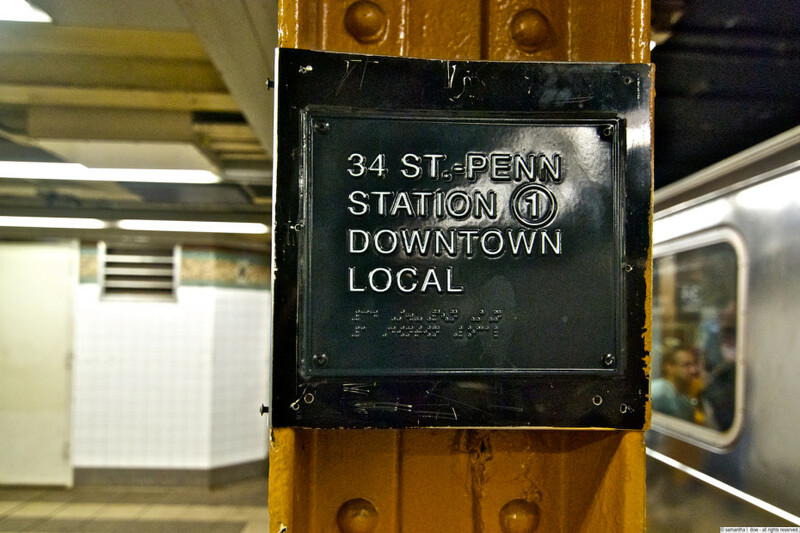 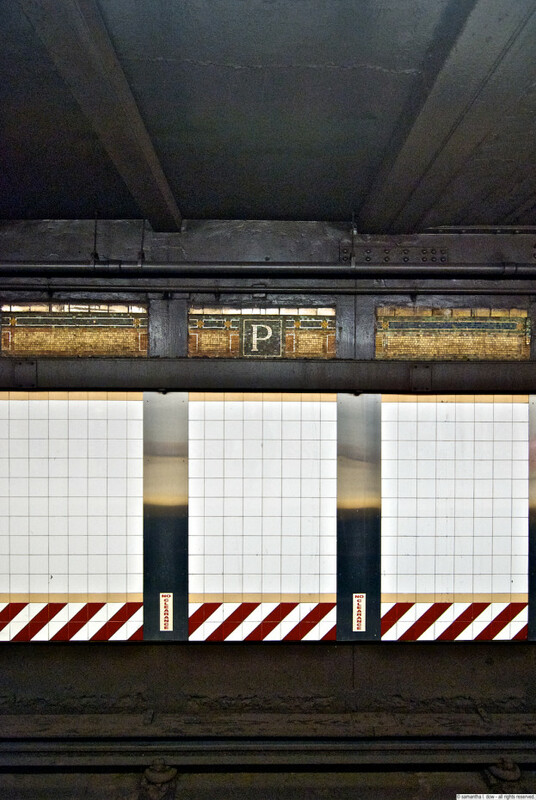 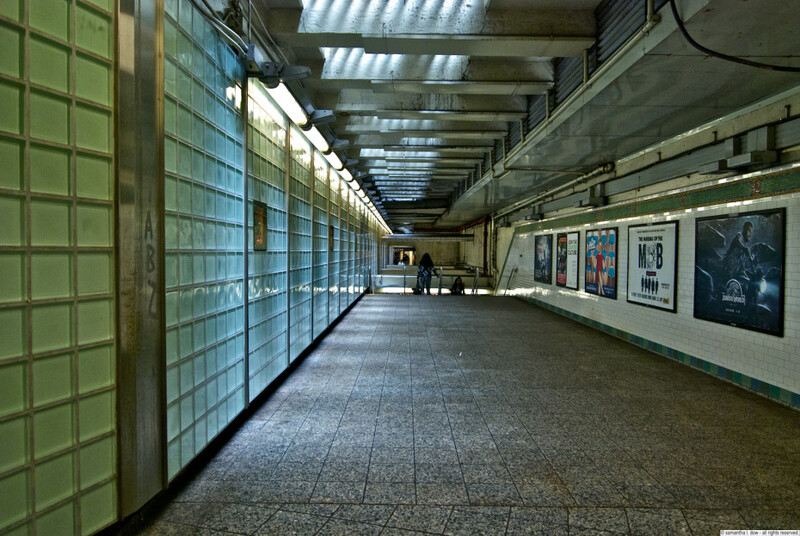 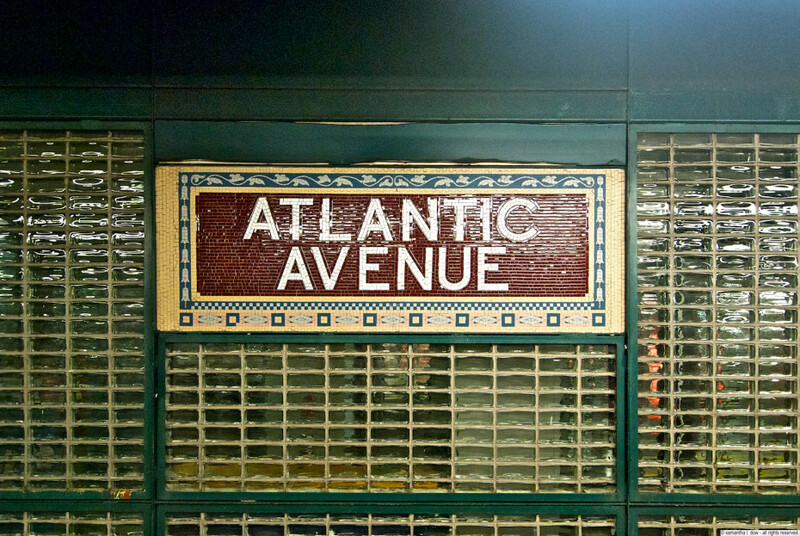 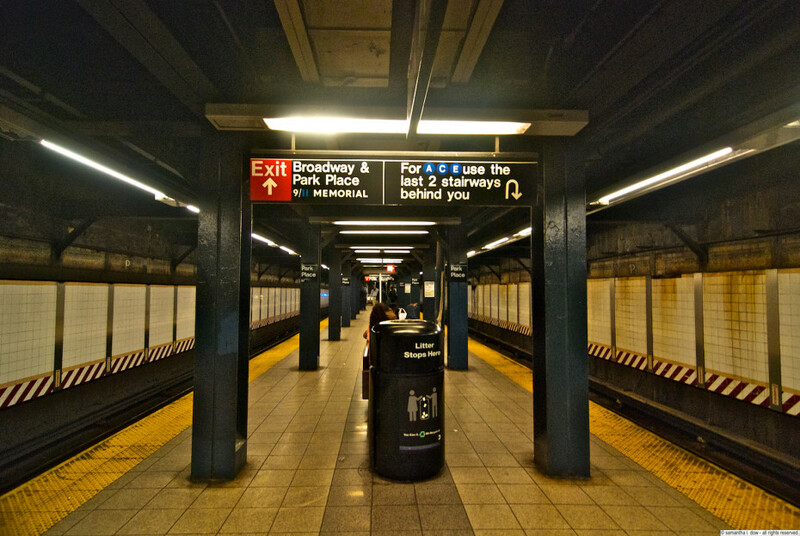 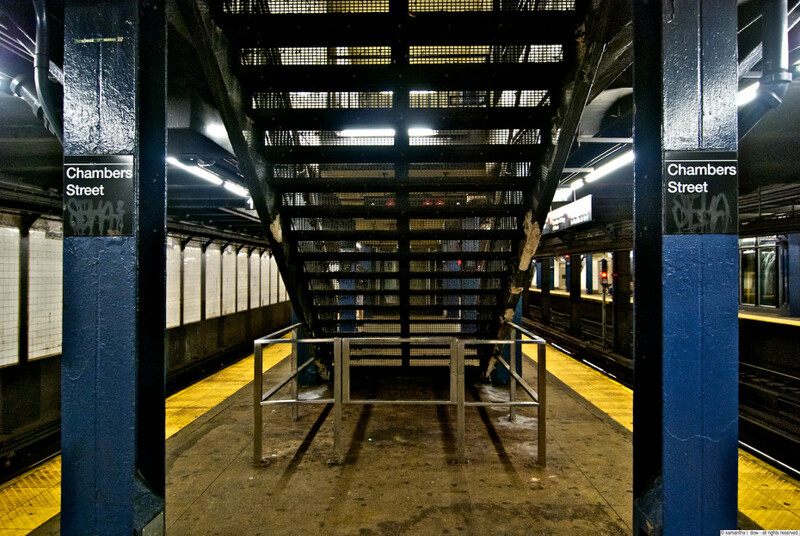 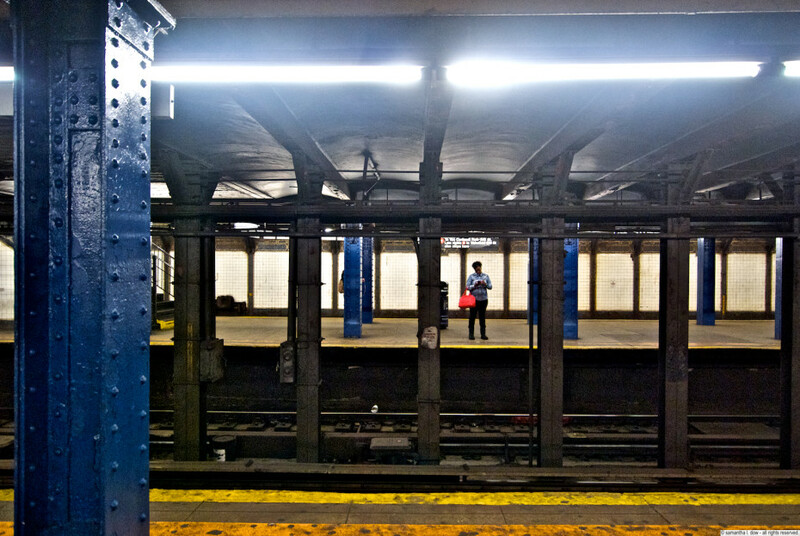 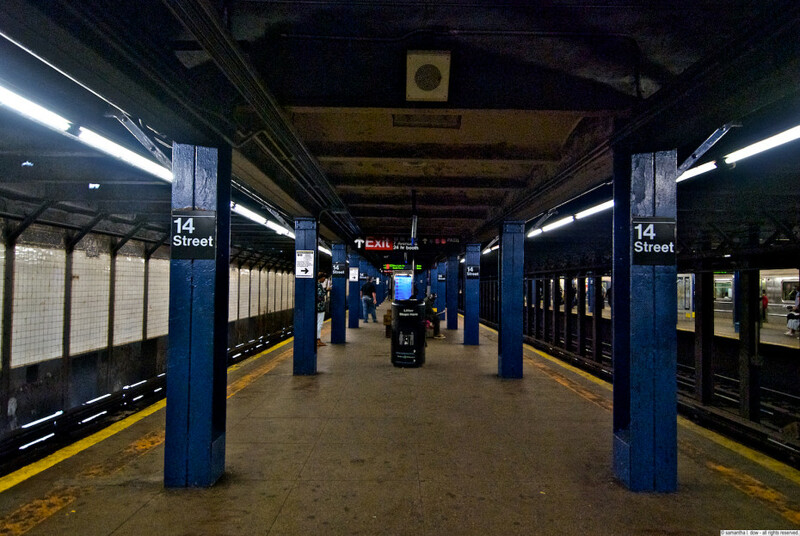 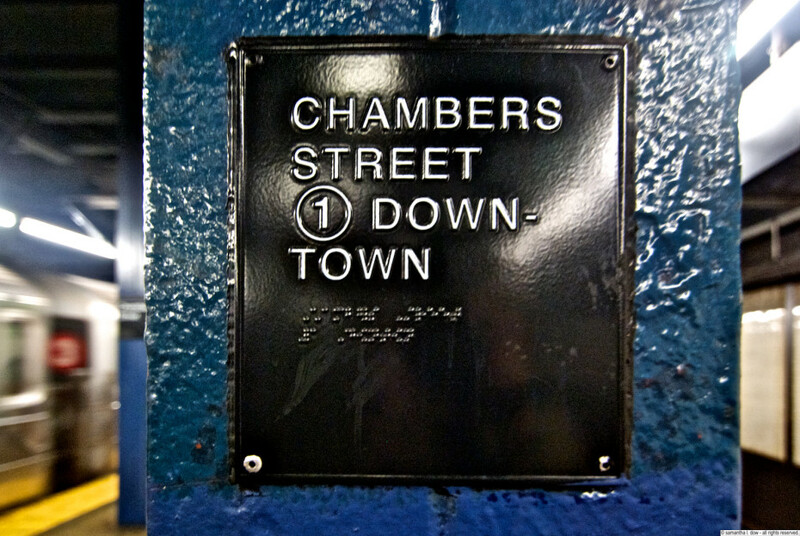 (Pacific Street is a station that technically doesn’t exist anymore and is now actually part of the Atlantic Ave complex – there will be a separate entry for the Pacific street platform). 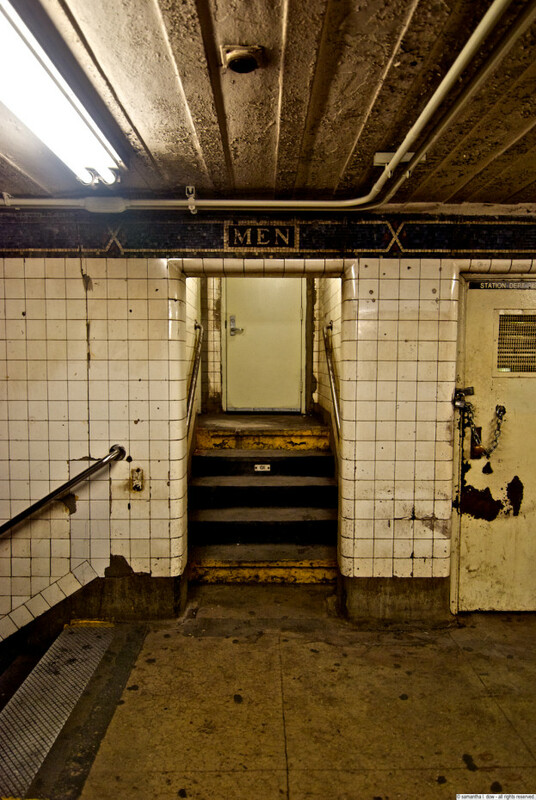 I decided to get some fresh air while I was turning around and took some shots of the original headhouse. 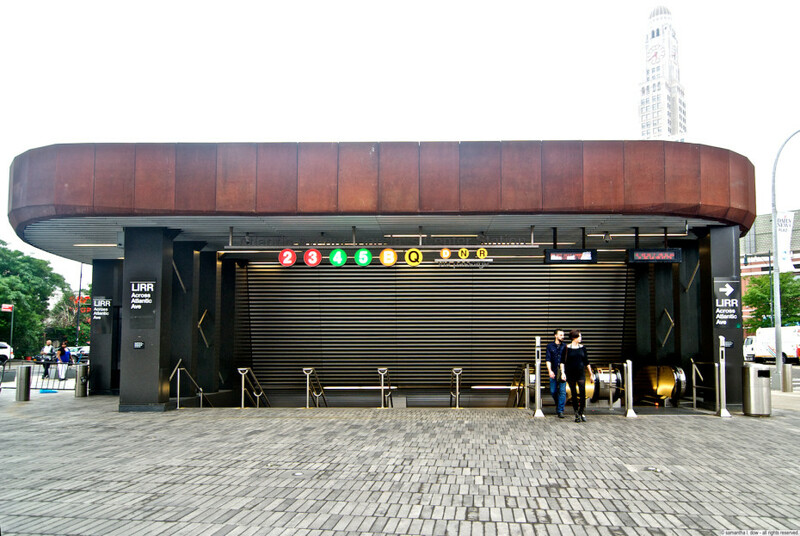 as well as the shiny new Barclays Center subway entrance. 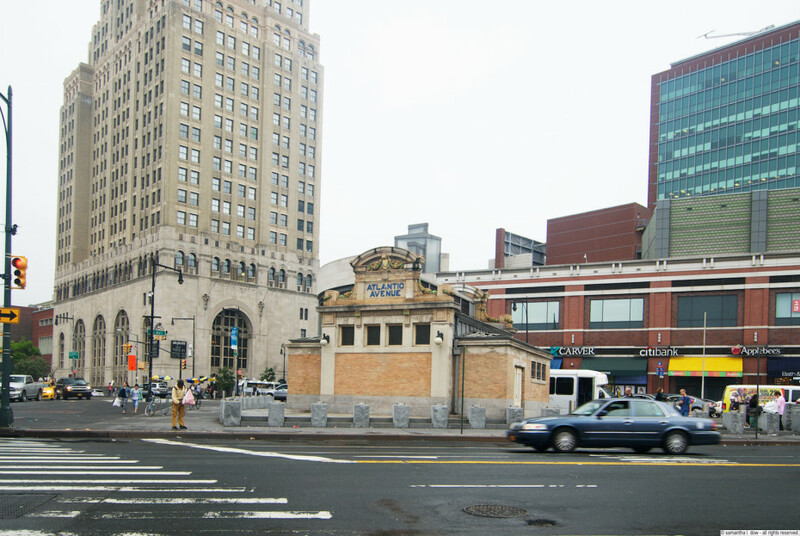 The original headhouse is not used as an entrance anymore and was actually moved from its original location – it’s purely decorative now and is used as a skylight for the station. 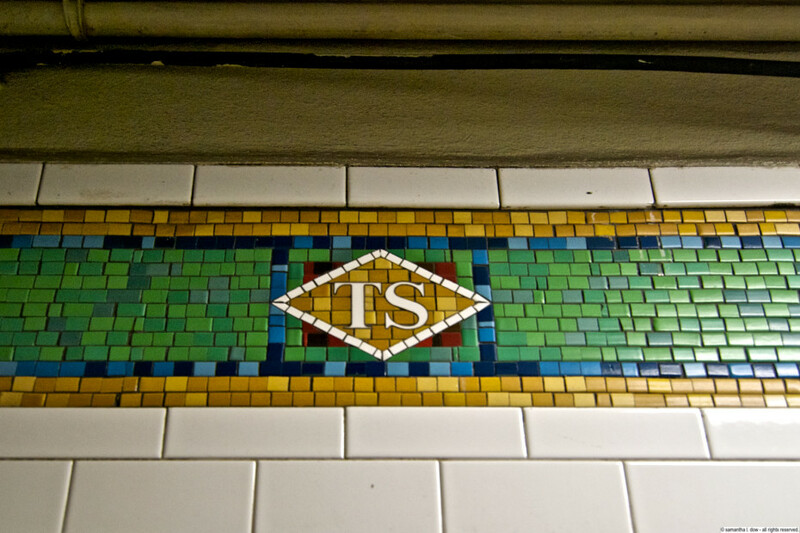 While this station has been entirely renovated, they have maintained the original (or original style) station mosaics and initial markers on this platform, even when embedding them in more modern surfaces, like glass brick. 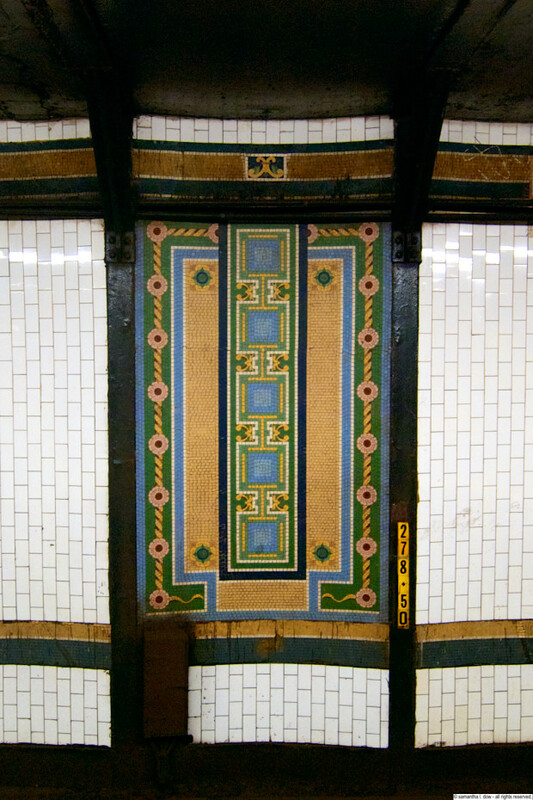 Reports indicate that this station was renovated in 2007-2009, but you wouldn’t be able to tell from the deteriorated condition of the wall mosaics. 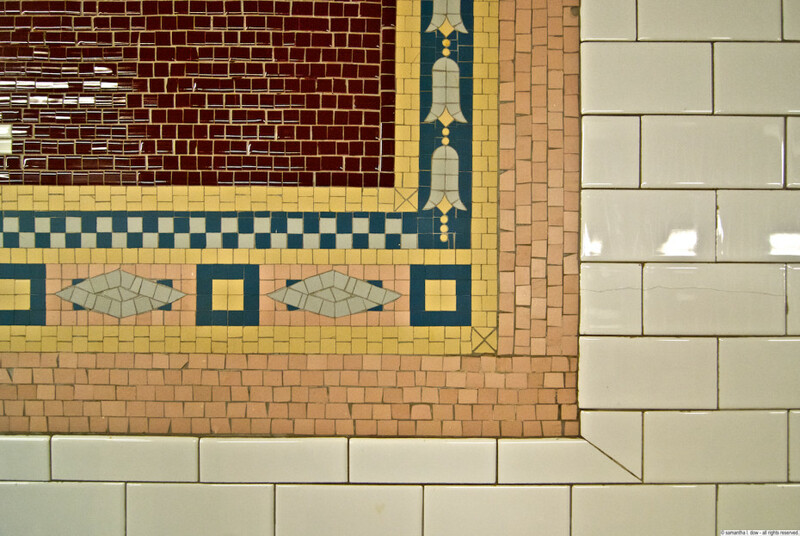 Here the barely visible and water-stained mosaics represent King’s College, which is now known as Columbia University, and which was located downtown in its original incarnation. 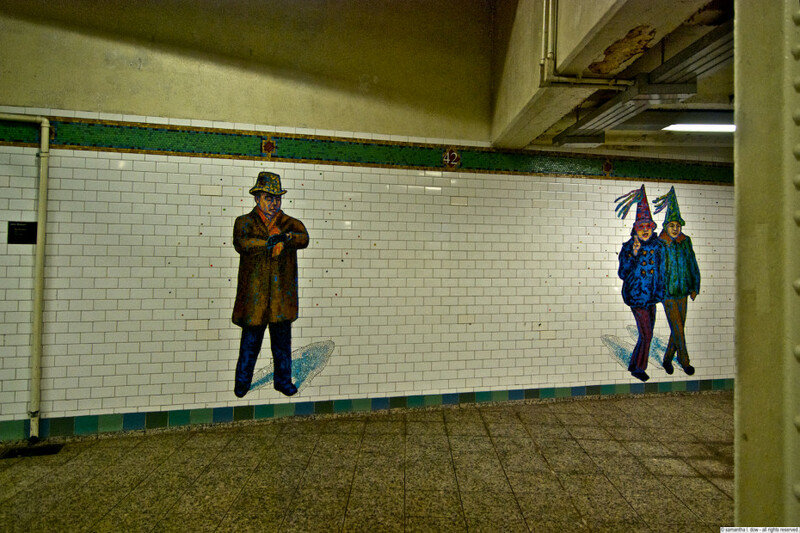 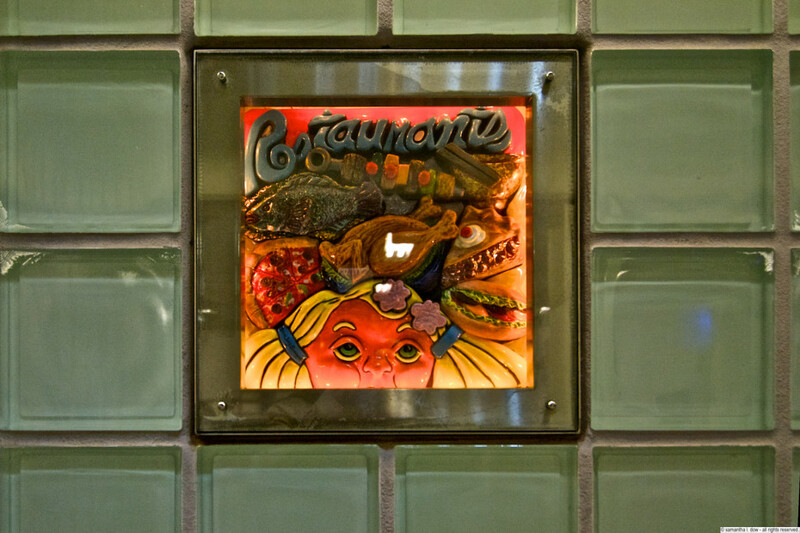 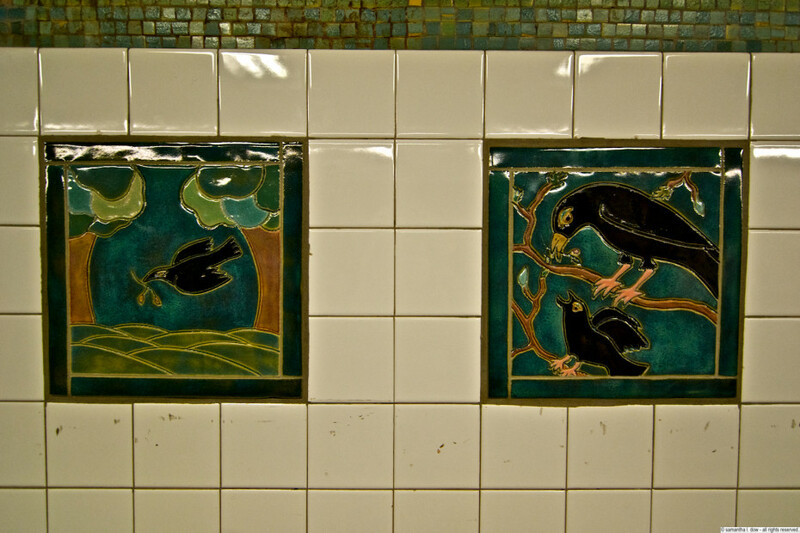 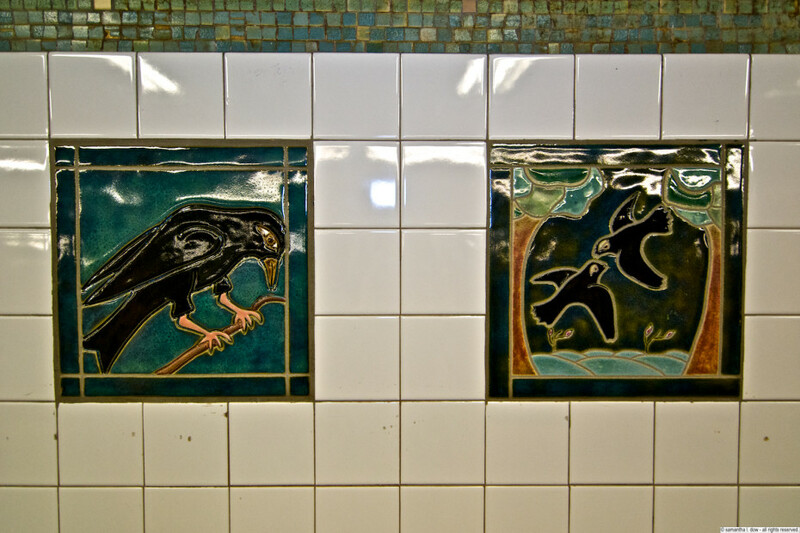 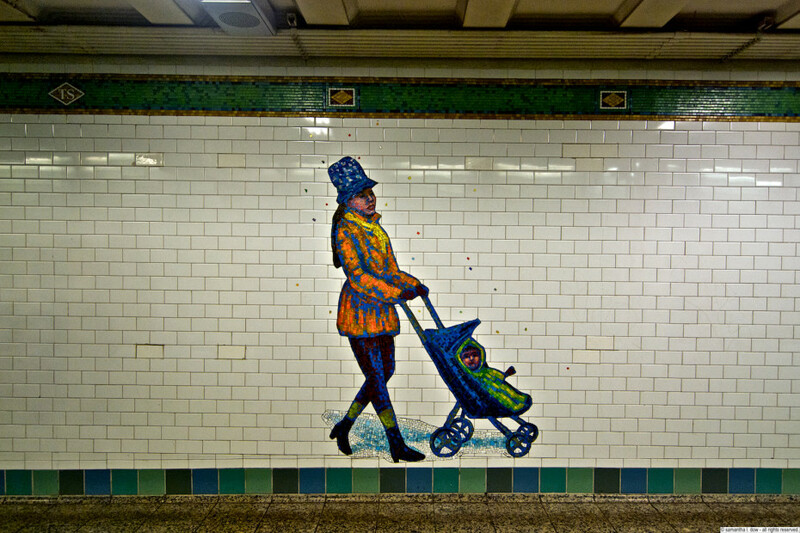 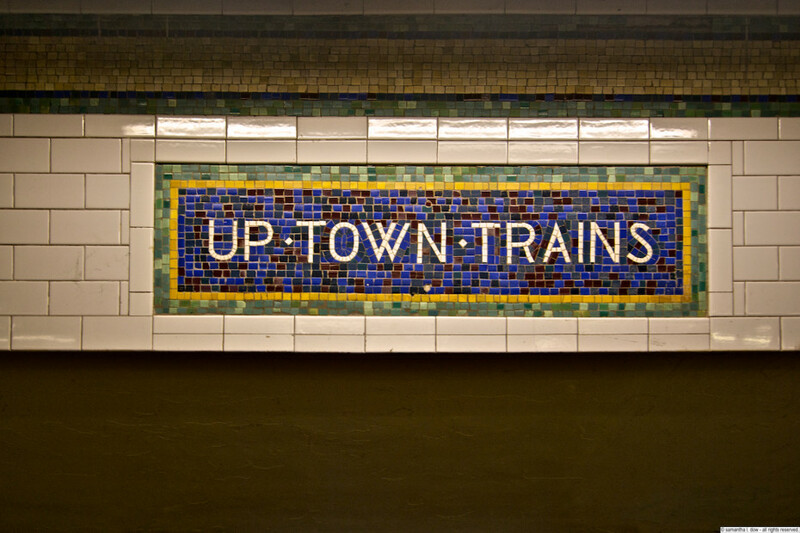 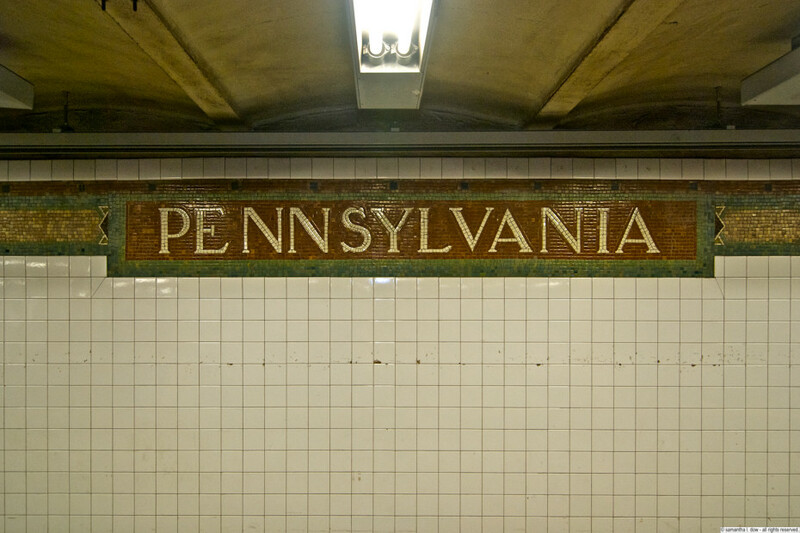 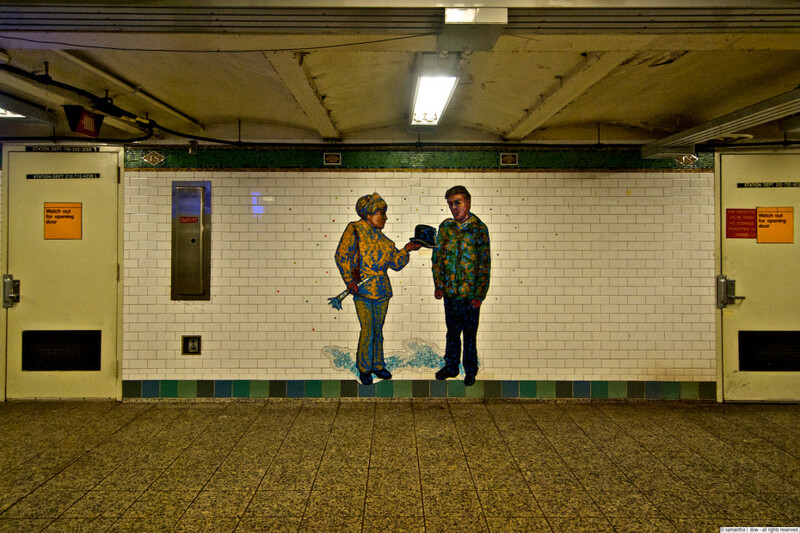 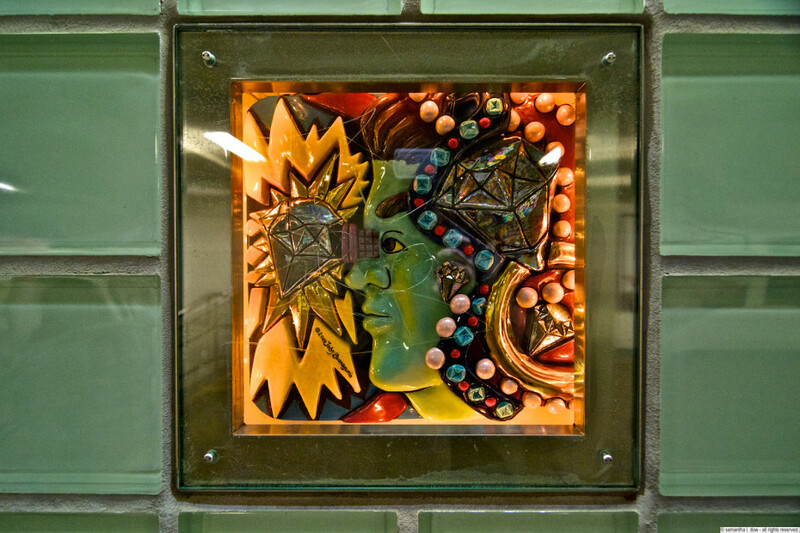 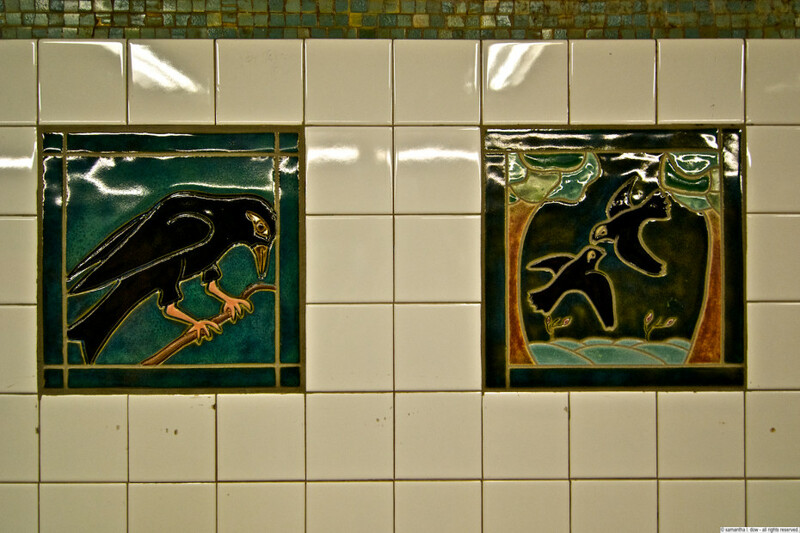 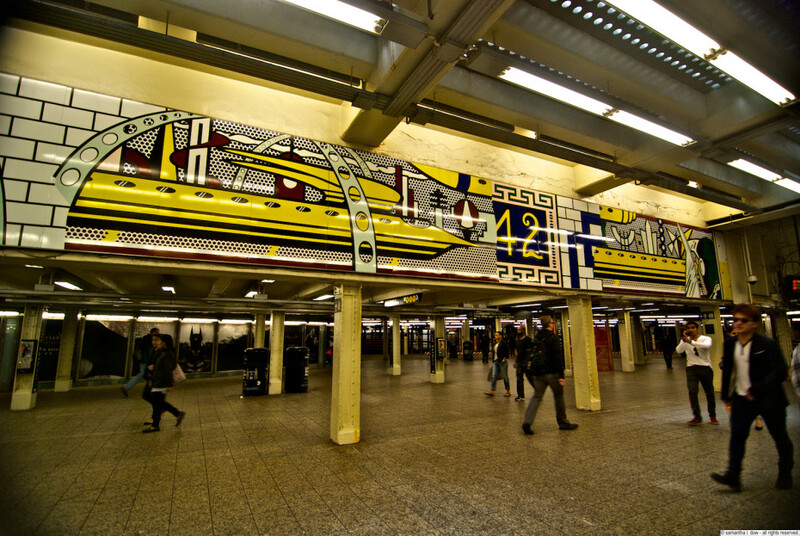 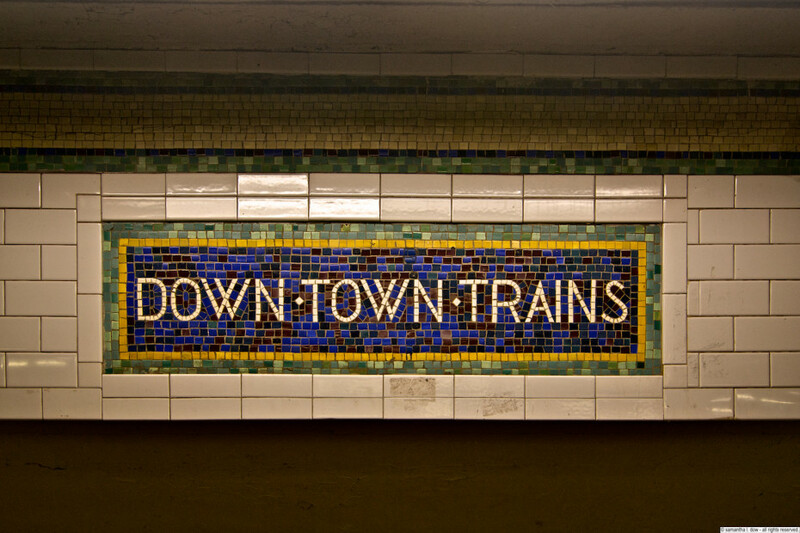 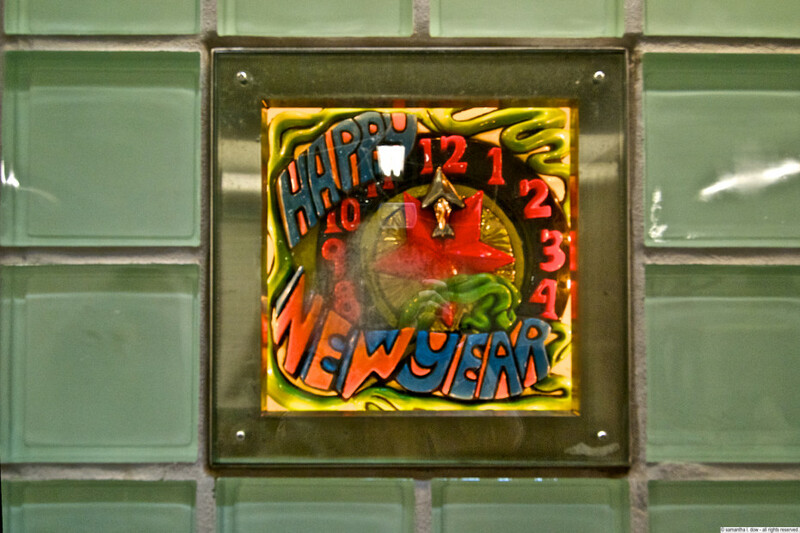 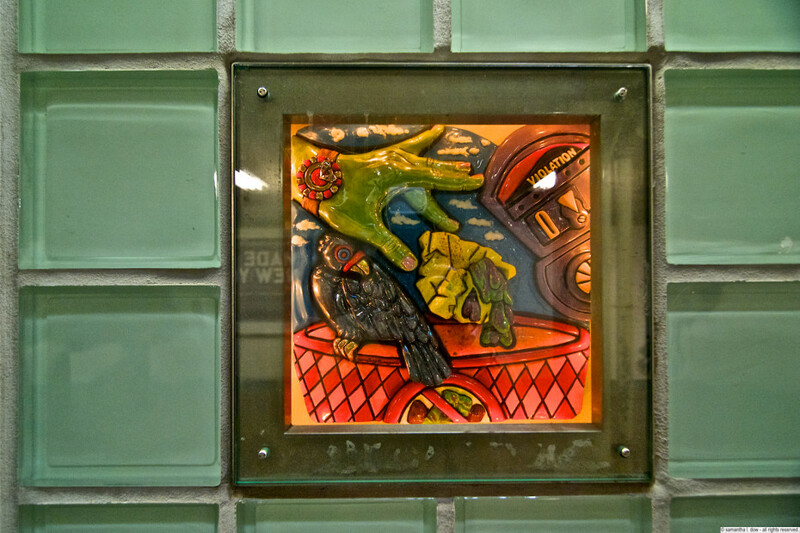 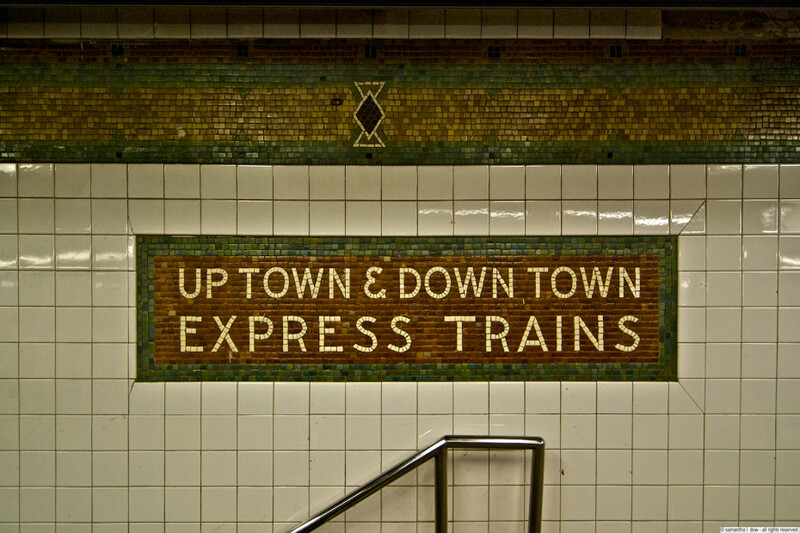 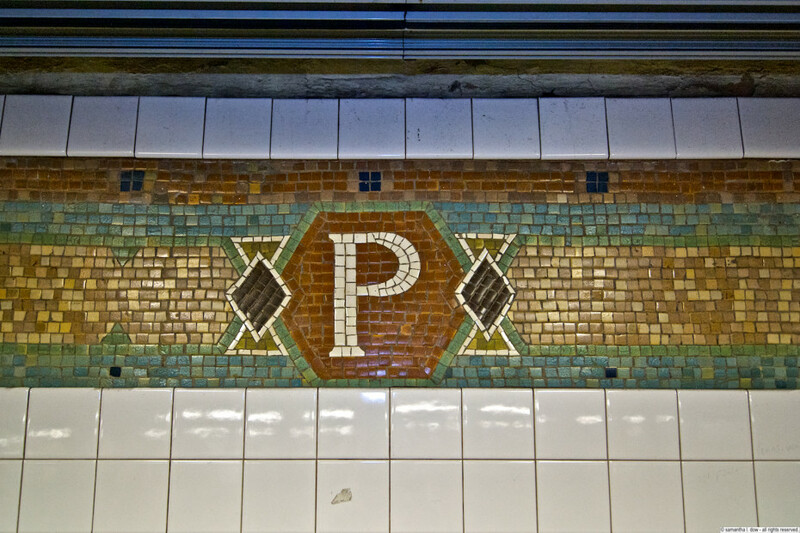 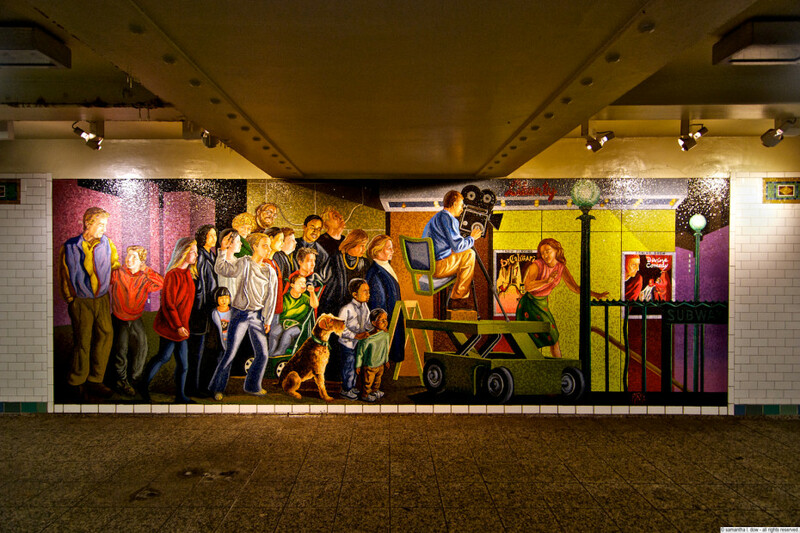 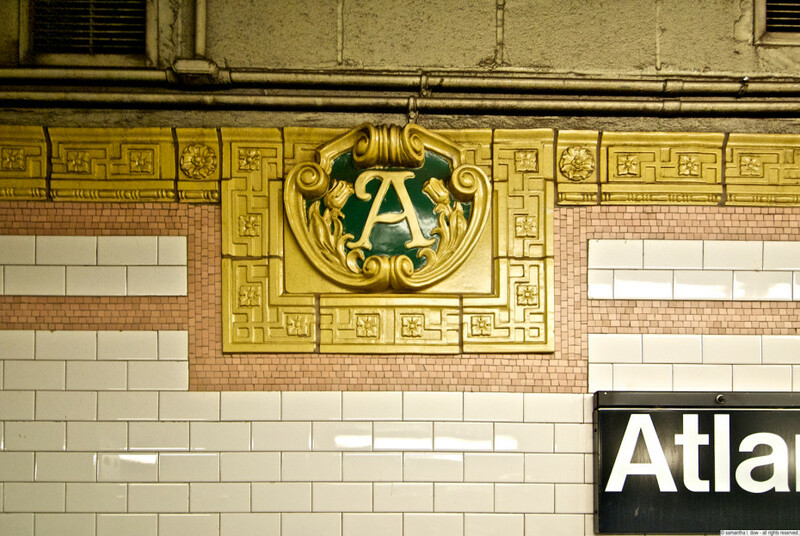 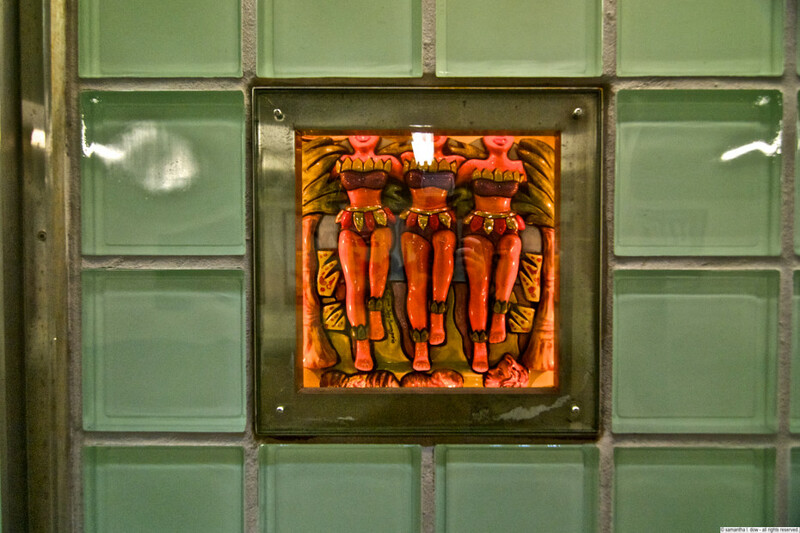 The 14th Street/7th Avenue IRT line is another “original mosaics/no other appreciable art” platforms. 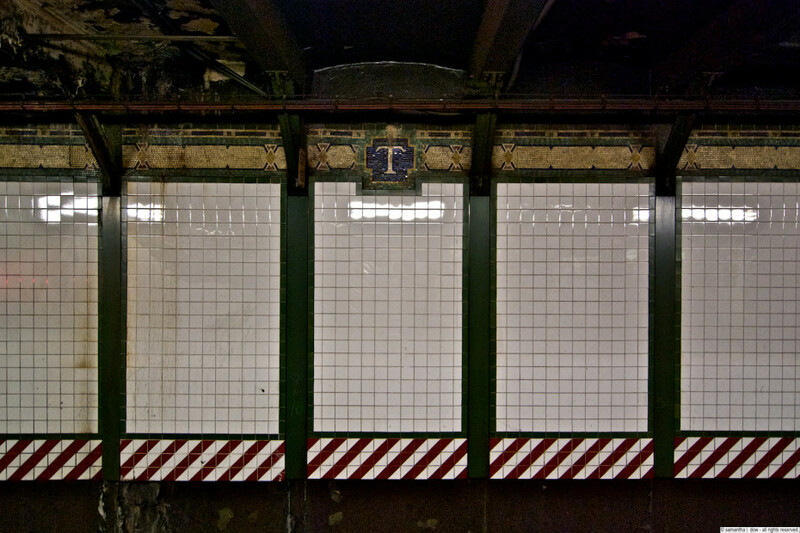 The mosaics themselves are the original trackside “14” tile work, much of which (as you can see from the photos) is fairly water damaged and clearly in need of repair. 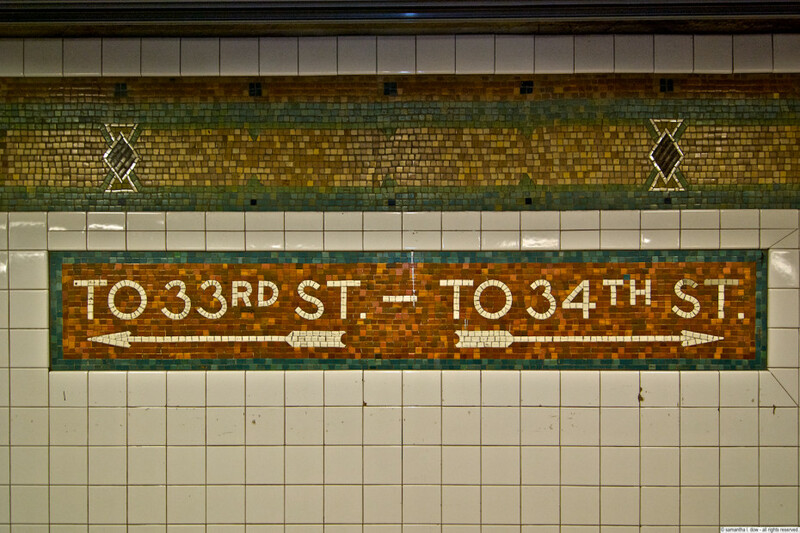 The station itself connects via a tunnel to the 6th avenue F/M/L (Ha!) 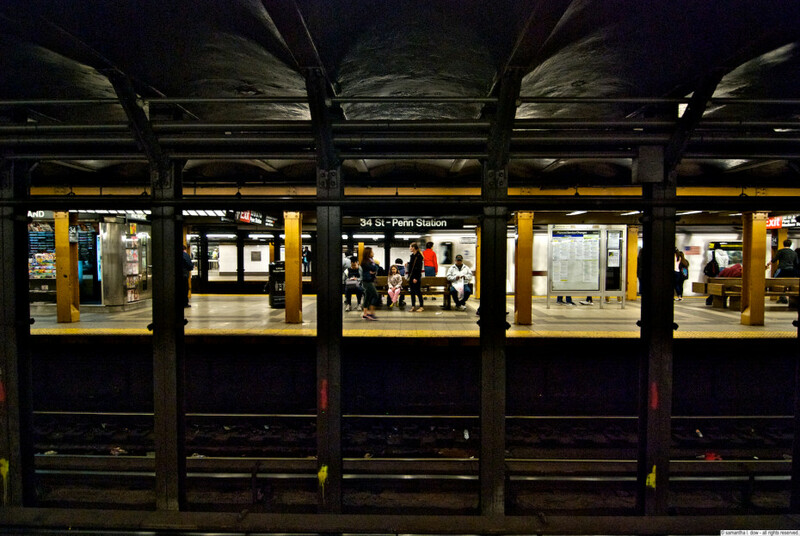 lines, but that’s a later-built connection between the two separate IRT and IND systems, and not a “natural” transfer point. 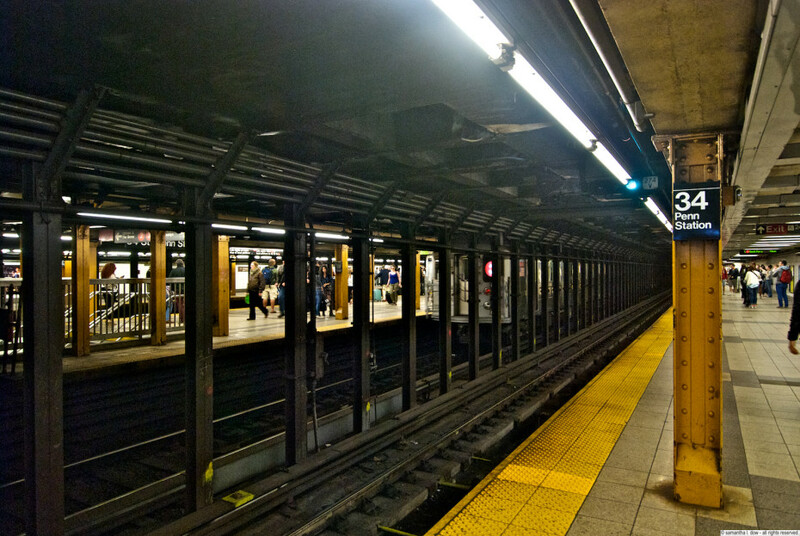 You’re basically walking a full avenue block (about a quarter-mile) underground in order to save the cost of a subway fare. 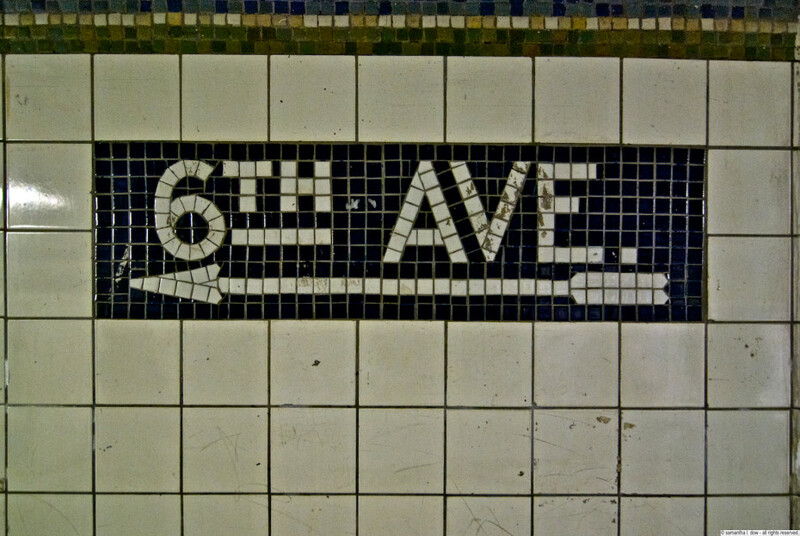 Pics of the 6th avenue line platforms are still to come. 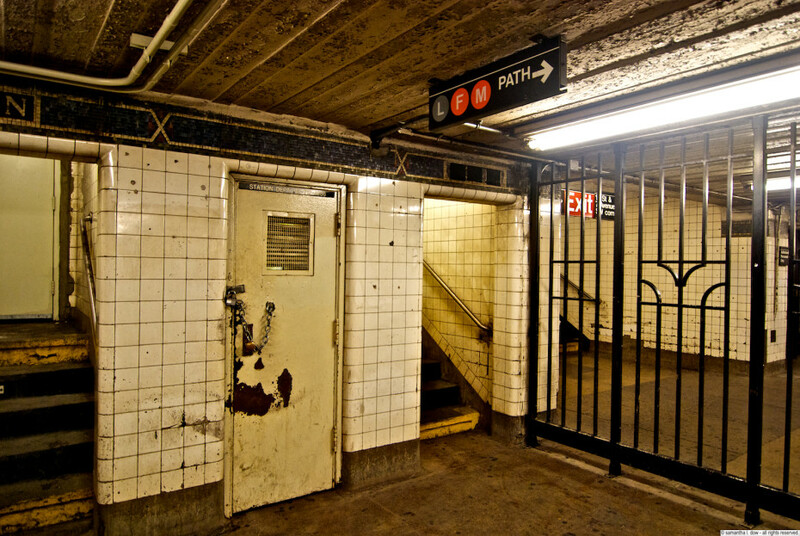 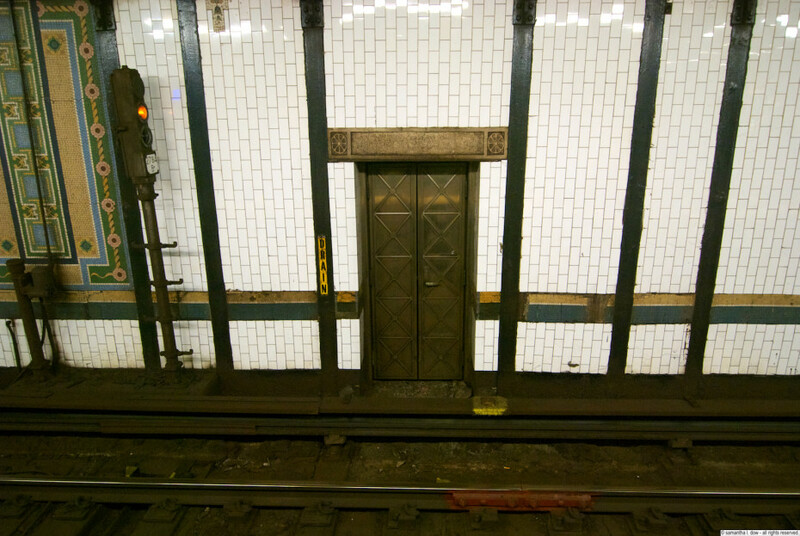 The station also apparently had a connection to the 8th avenue A/C/E line at some point in the past, but it’s been gated off and is inaccessible today. 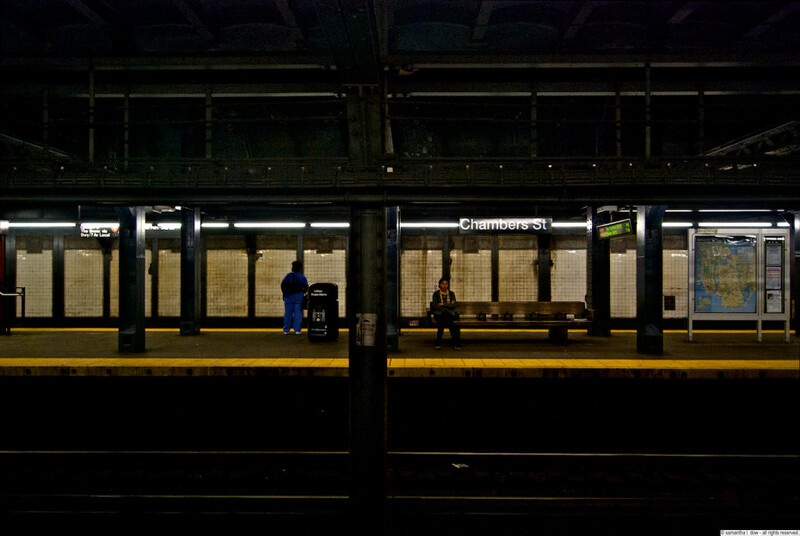 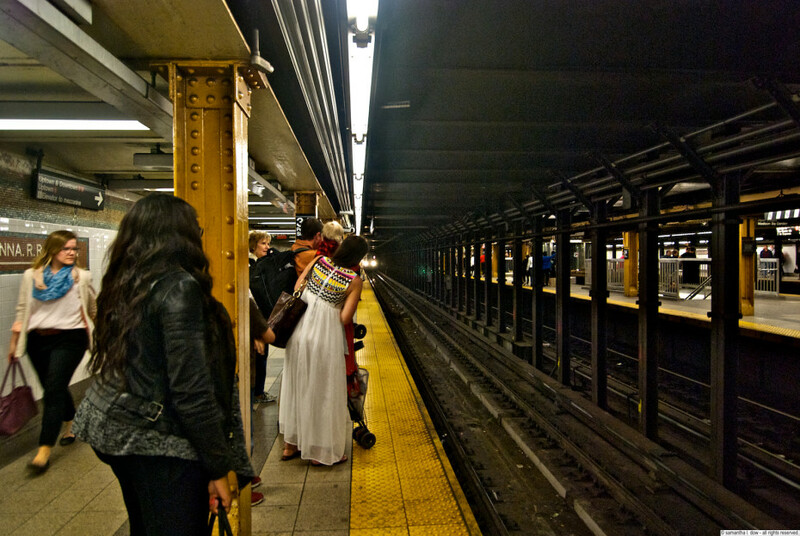 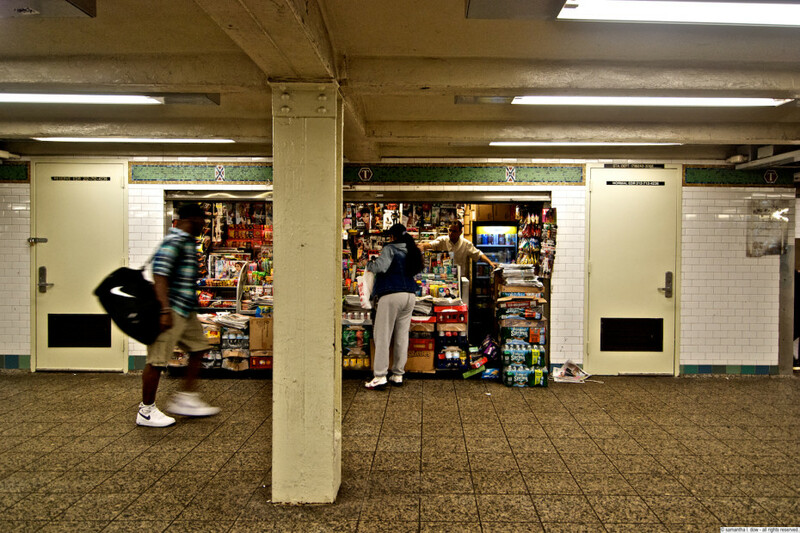 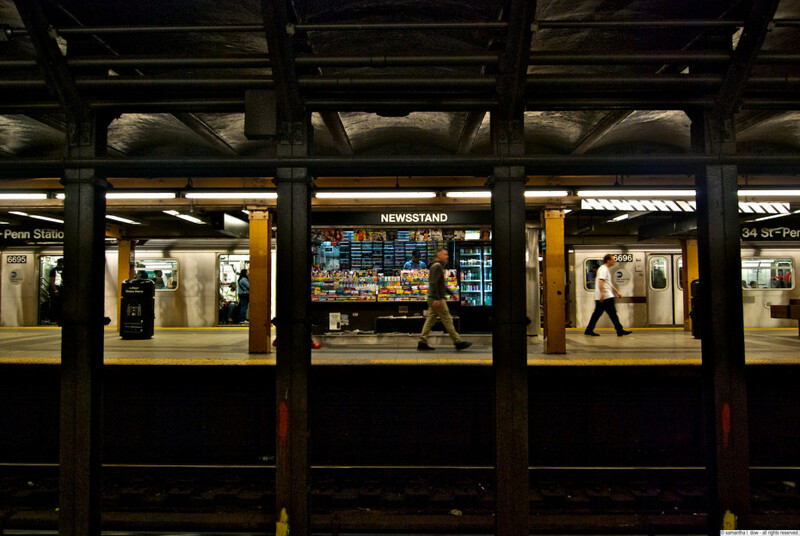 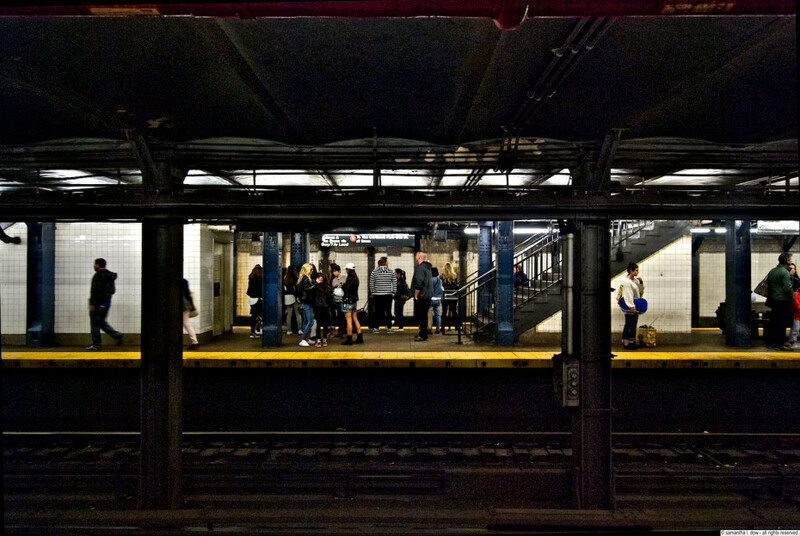 I had mentioned a few weeks ago a long simmering thought for a photography project, involving shooting all of the stations in the new york city subway system. 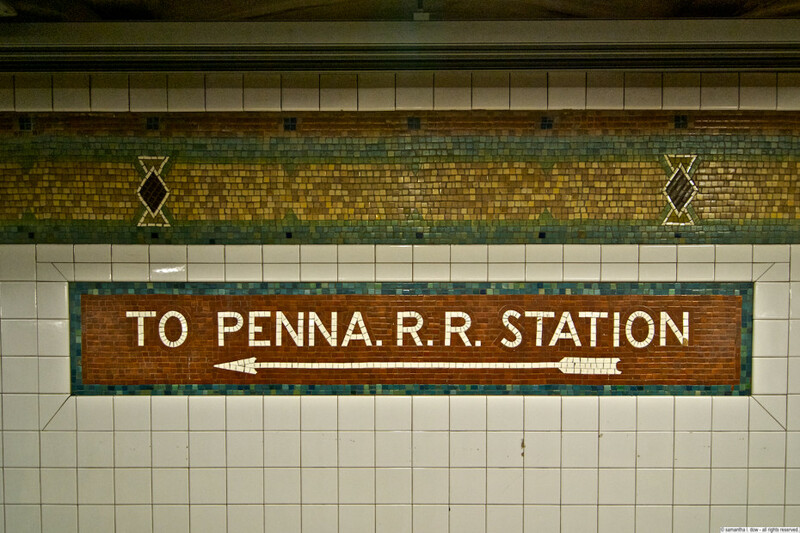 it’s a daunting task, as there are over 400 stations and hundreds of miles of tracks. 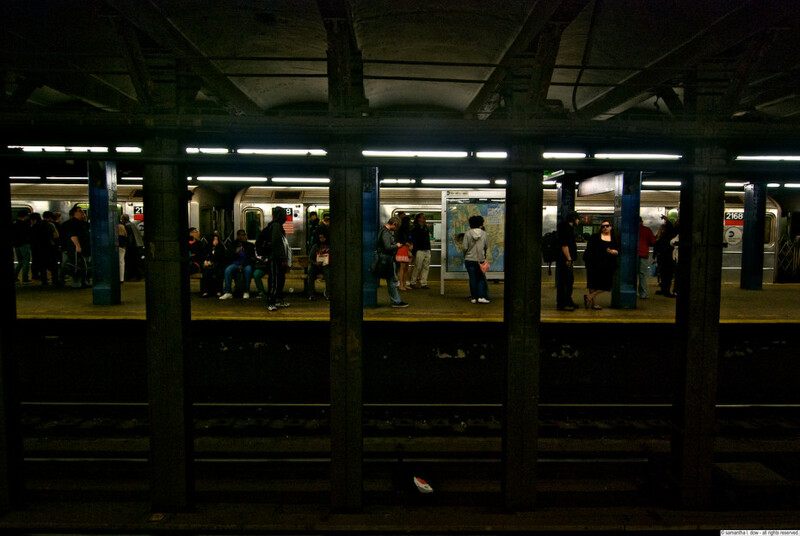 But I would not be daunted. 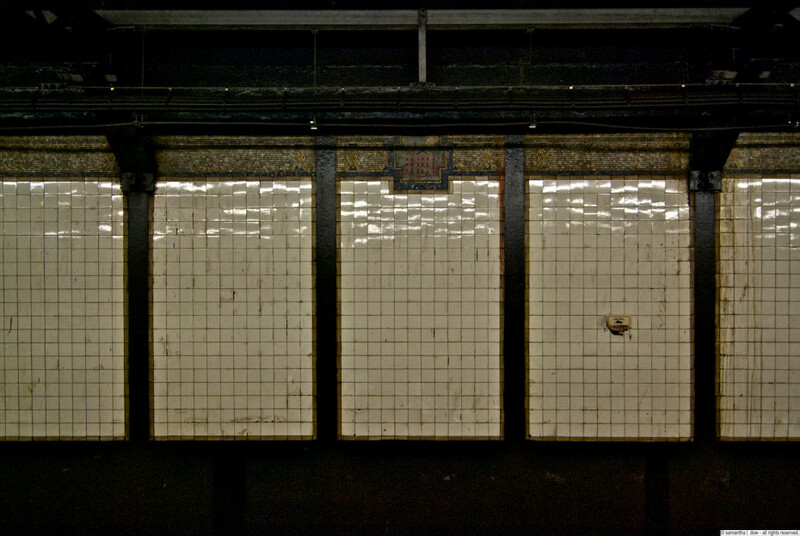 I decided to start mapping out a plan, involving doing very small pieces at a time, and only at my leisure. 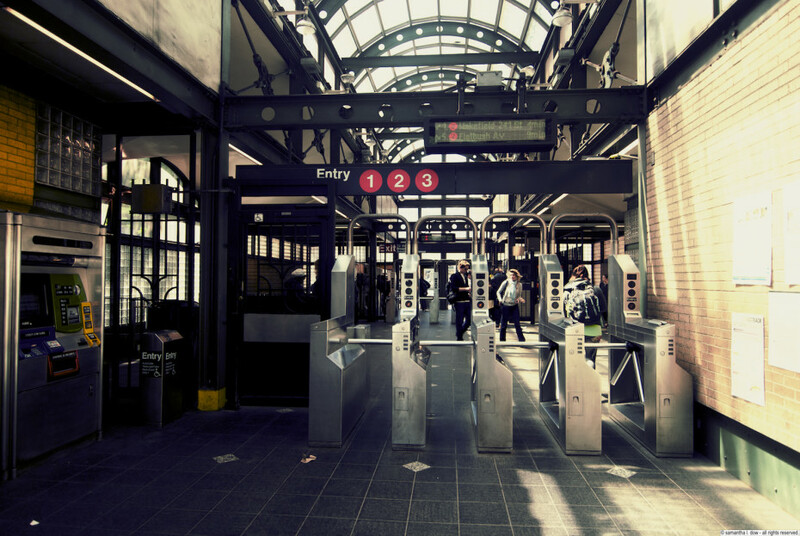 The first bit of business was to switch from a pay-per-ride to an unlimited metrocard, which I was able to do the other day. 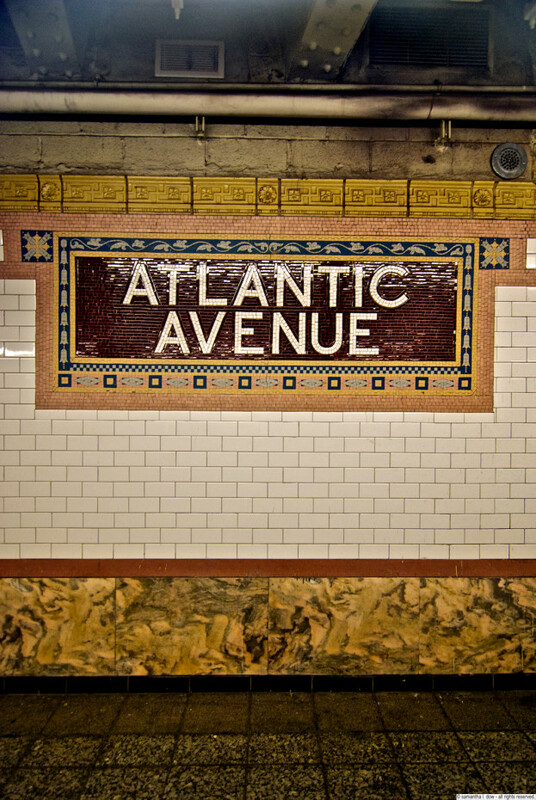 Today, I picked a train and a direction, taking the 1 train from my neighborhood down to the end of the line at South Ferry, hopping off at every stop to take pictures of the platform, the mosaics, the tracks, and whatever else was of interest. 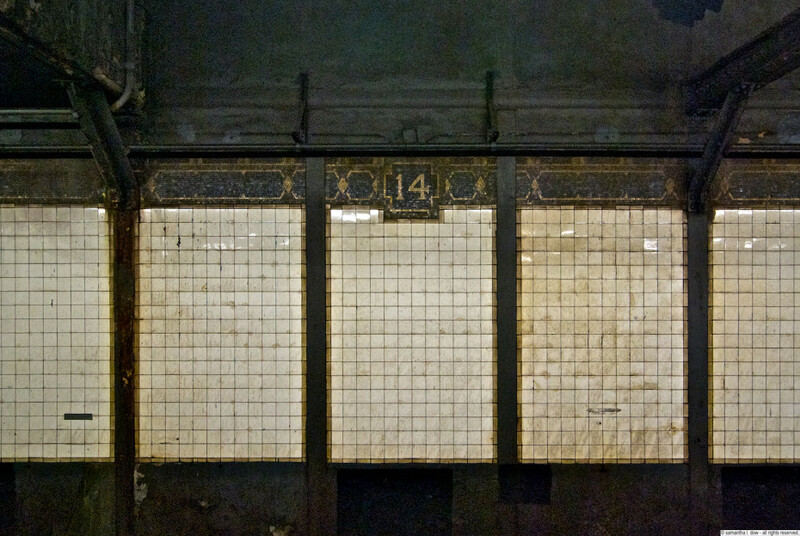 There were a few stations I had to skip thanks to the vagaries of “weekend work” by the MTA (the train was running express from 14th to Chambers today), but it was a good start. 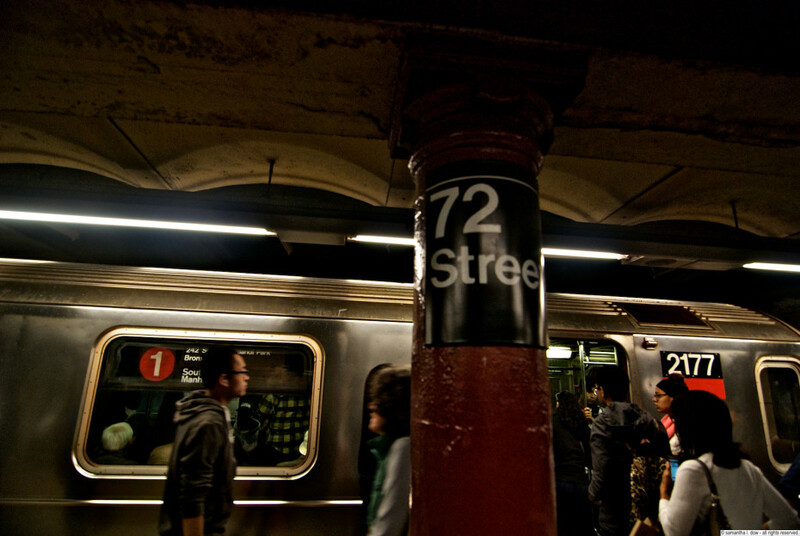 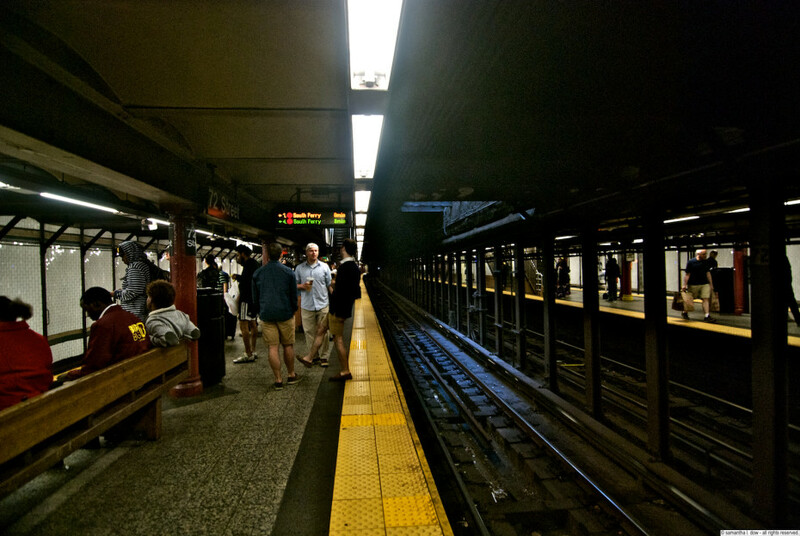 I’m going to be posting separate entries for each station, and I’m going to be doing it relatively slowly so that there’s no great influx of posts, but I thought I’d start with where I started, at the West 72nd Street 1/2/3 station. 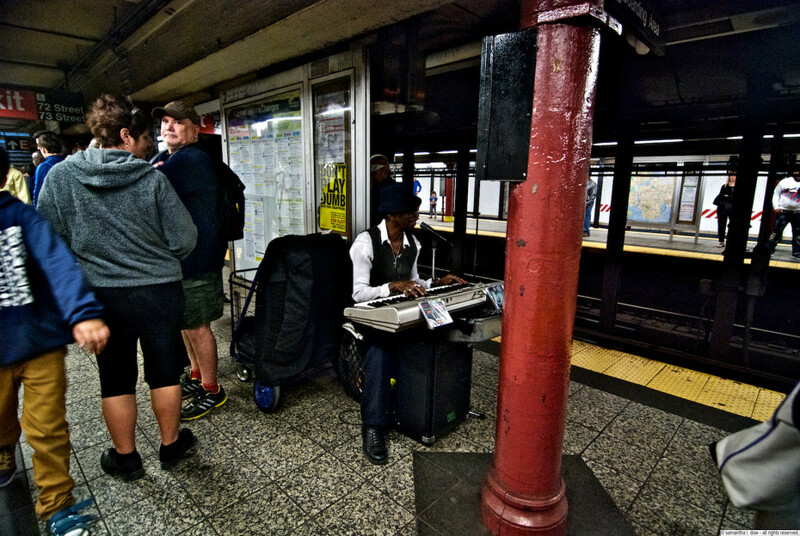 It’s your typical Saturday holiday weekend tourist crowd, with buskers, idiots pretending to jump on the tracks, and people who don’t understand how to wait for others to get off the train first before they try to board. 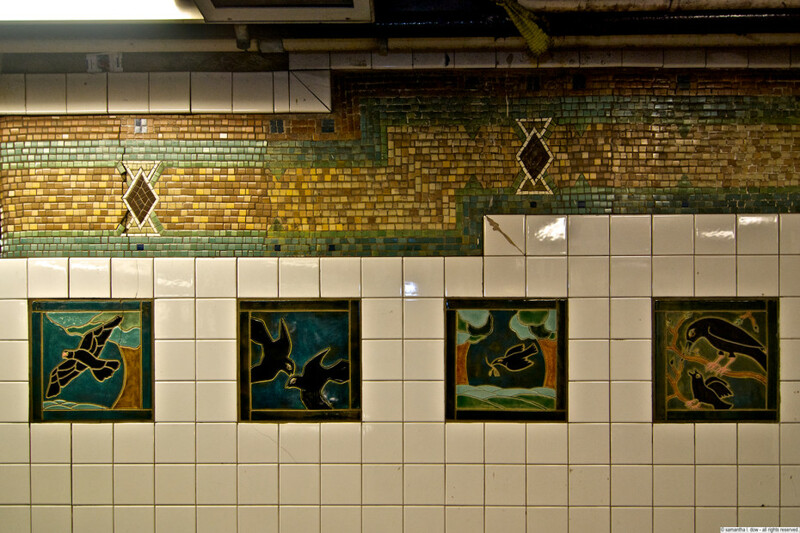 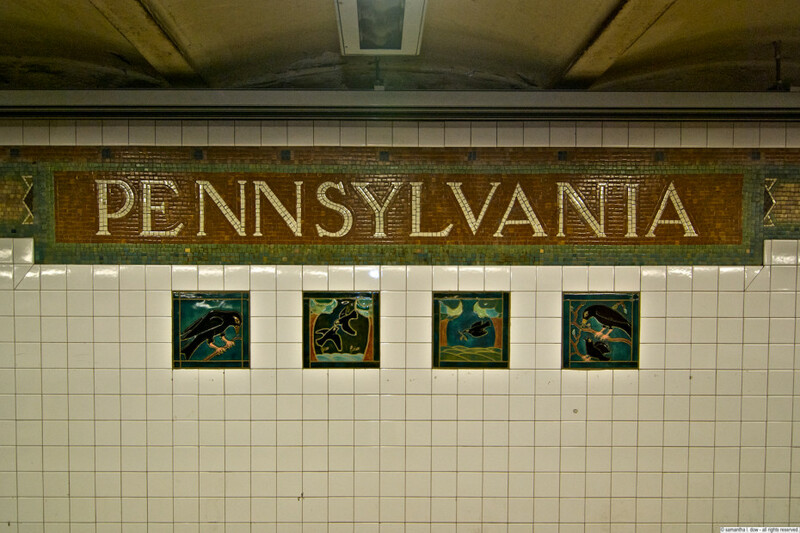 I’ve always thought the mosaics in this station were relatively abstract, and everything I can find online about them simply refers to them as “mosaic tapestries”, but as I look at them, they start to remind me of the 91st street garden in Riverside Park, with it’s squared off garden in the middle surrounded by a walkway. 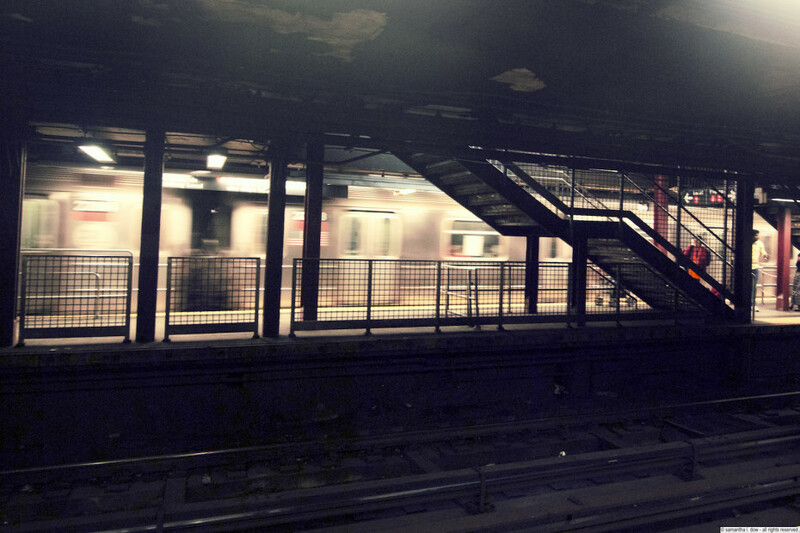 In any event, that could all be in my head.